One of the Classic Robusto cigars that has proved its worth throughout the ages. This Cuban legend, first introduced in the 1930's, has seen its blend toned down in strength to allow more flavor to come out. 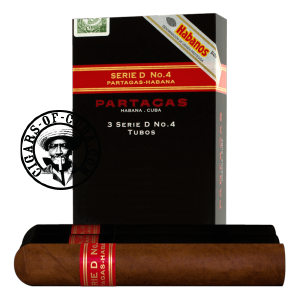 This 'toning' of the blend has made this Partagas even more popular and it is now the leader of the Cuban hand rolled Robustos. Excellent construction gives very reliable draw, again adding to the popularity of this cigar. A Cuban blockbuster. Fresh cedar wood notes, with some hints of spices. Remember the particular cedar wood (but creamy) smell given off when you just open a D4 box. A marvelous draw. Very generous smoke, marked by a special earthiness, with some fresh cedar wood notes. A particular taste of tanned leather is present in the first third (remember the creamy smell mentioned while opening the box). In the second third, the cigar is woody, with some spicy notes and rare hints of nutmeg.